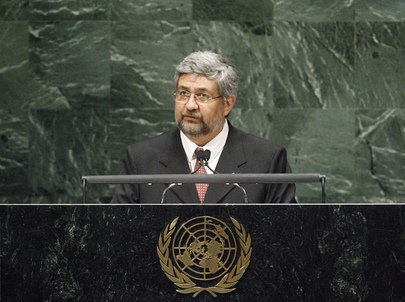 HÉCTOR LACOGNATA, Minister for Foreign Affairs of Paraguay, called for strengthening the United Nations as the body capable of representing the interests of all States for a more equitable world, guaranteed by the full force of international law. Paraguay was very pleased that some great Powers had returned to the path of multilateralism as problems besieged mankind and could only be resolved with the help of all States. While there had been achievements towards the Millennium Development Goals, there were still inequalities around the world. Indeed, millions of people still lived in abject poverty, exacerbated by the sudden increase in the price of food and consequences of climate change. Paraguay was betting on the globalization of democracy with social development, and was committed to including women in all areas of public life. International solidarity could be enhanced through regional integration, sovereignty of peoples and design of a new international financial architecture whereby institutions could contribute to job creation and fair trade conditions. Paraguay was greatly concerned many citizens had to migrate, notably to Europe and North America, to seek fulfilment, and he expressed solidarity with those suffering from discriminatory and violent migratory policies. Migratory policy was a matter that must respect international human rights norms and he called on nations receiving migrants to use hospitality in working with those wishing to have a dignified life far from their respective countries. He proposed deepening dialogue to find an equitable solution. Decent employment was a worldwide objective and it was important to improve international cooperation to deal with macroeconomic issues that would help solve that problem. Donors must insist that employment be central to the implementation of political decisions. Disarmament, non proliferation and controlling the spread of weapons of mass destruction were not just key for ensuring peace and security, but also guaranteed sustained development. He condemned coercive economic measures that denied countries their right to determine their own economic and social systems, firmly rejecting measures against Cuba and calling on the Assembly to end the blockade that undermined international law and principles of sovereignty. The United Sates must also adopt measures to put an end to the irregular detention of five Cuban citizens in American jails. Paraguay reiterated its commitment to peace and international security and would continue to contribute to peacekeeping efforts. Aware of the serious and complex threats of climate change, Paraguay supported an urgent, coordinated global response to reverse its tragic and devastating consequences. He also called for the sovereign right of peoples to manage their natural resources, in the broadest sense of that expression. A new international financial architecture was needed for fair trade mechanisms and efficient regulations, and the United Nations should play a central role in guaranteeing the success of efforts to achieve better international coordination. The issue of landlocked developing States was fundamental for Paraguay’s foreign policy, and they required special and differential treatment to integrate into the globalized world. The United Nations must adapt to current realities and Paraguay supported strengthening the General Assembly, helping it recover its role conferred by the Charter. Paraguay also supported full adherence to multilateralism and believed the Security Council needed to be expanded to be more democratic. To promote the spirit of fraternity and values of the United Nations, Paraguay proposed that 30 July be designated as the “World Day of Friendship”. Paraguay believed in the equality of nations large and small, which would help improve conditions under which justice could be maintained.